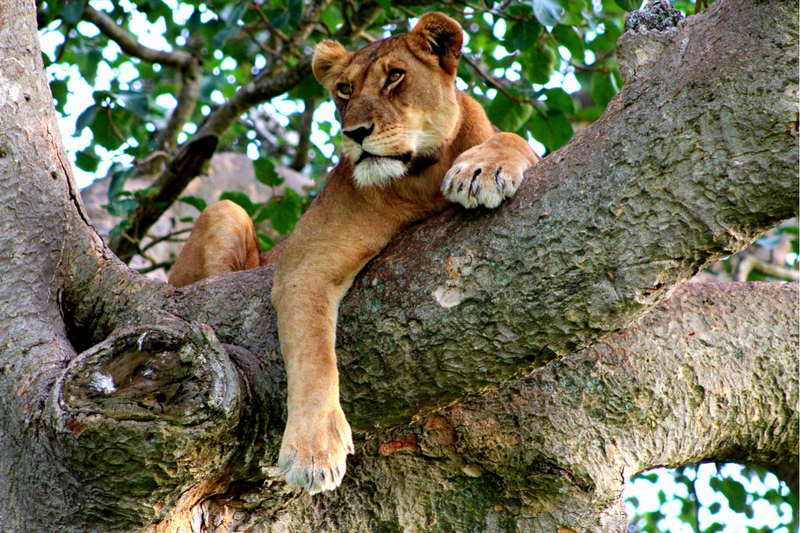 Uganda is an amazing destination for travelers who are interested in nature attractions. Uganda is a place where visitors can experience one of Africa’s seven wonders of nature as well as one of the most unique encounters with wildlife. What are the 7 Wonders of Uganda? Uganda is full of nature and wildlife attractions. It is an African country that should make the bucket list of desired destinations on the continent. The Nile River is one of Africa’s 7 Wonders of Nature. Subsequently, travelers who have the Nile River as one of their bucket list attractions can check it off with a visit to Uganda. The Nile River is the longest river in the world stretching a distance of 4,132 miles (6,650. The Nile River extends through 10 different countries where the mouth of the river Egypt exits into the Mediterranean. Uganda is home to one of two sources that make up the Nile River. The White Nile River exits out of Lake Victoria to start the journey to the Mediterranean. The Nile River can be experienced a number of different ways with a visit to Uganda while also experience other Uganda wonders. Lake Victoria, a wonder of nature, is a source of the Nile River with this river flowing westward where it can be experienced through Murchison Falls another wonder of nature attraction for Uganda. Bwindi Impenetrable National Park is located in the south-western part of Uganda along the border of the Democratic Republic of the Congo. The park is comprised of 128 square miles (331 sq. km) of montane and lowland forest and one of Uganda’s most intriguing attractions. 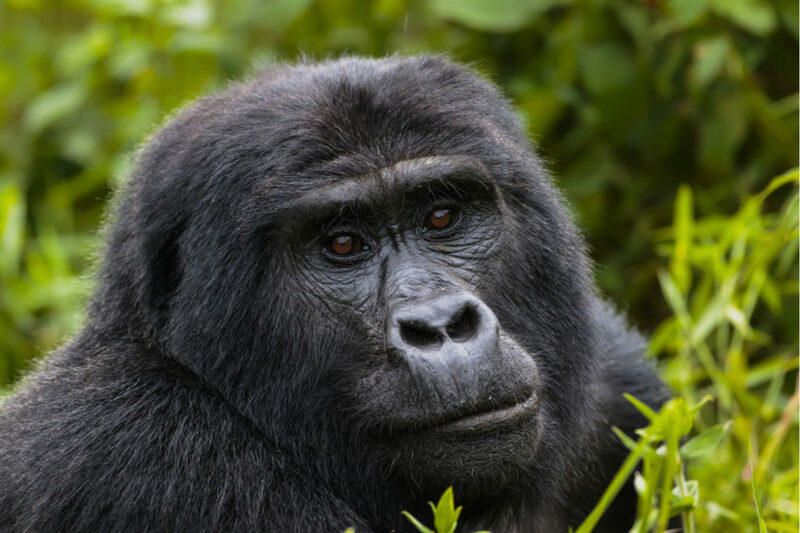 Bwindi Impenetrable National Park is most famous for the 340 Bwindi gorillas accounting for 50% of the world’s population of the critically endangered mountain gorillas. Chimpanzees and colobus monkeys are additional primates calling the park home. Additionally, visitors can potentially encounter some of the 120 species of mammals, while bird watchers may be able to see some of the 348-different species of birds. Recognized as a World Heritage Site, Bwindi Impenetrable National Park’s excess of over 1,000 flowering species of plants makes it the most diverse forest in East Africa of which some are endangered. The mountain gorillas are the primary attraction of the park with the country having four different gorilla groups that have become accustomed to visitors and serve as a tourist activity that is unique leaving people amazed at these magnificent creatures. 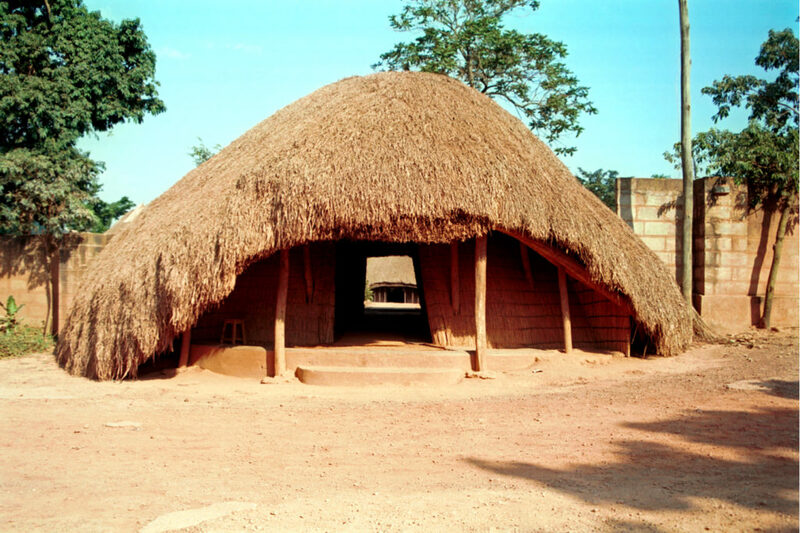 The Kasubi Tombs serve as the burial grounds for four kings of Buganda known locally as kabakas. The tombs are also burial spots for additional members of the Baganda royal family. As a UNESCO World Heritage Site, the Kasubi Tombs are unique building structures comprised solely of vegetal materials. The area is comprised of 64 acres (26 ha) and located on the Kasubi hill in the city of Kampala. The Kasubi Tombs, containing 4 kings of Buganda, is one of 31 royal tomb burial sites from across the Buganda kingdom. It is one of the most popular tourist attractions in Uganda and remains an important spiritual and cultural site for the people of Uganda. Lake Victoria is a Great Lake in Africa named after Queen Victoria. With a surface that extends across stretching 26,000 square miles (68,800 sq. km), Lake Victoria is the largest tropical lake in the world. It is also the largest fresh water lake in Africa based on surface area; it is second in the world to Lake Superior in North America. 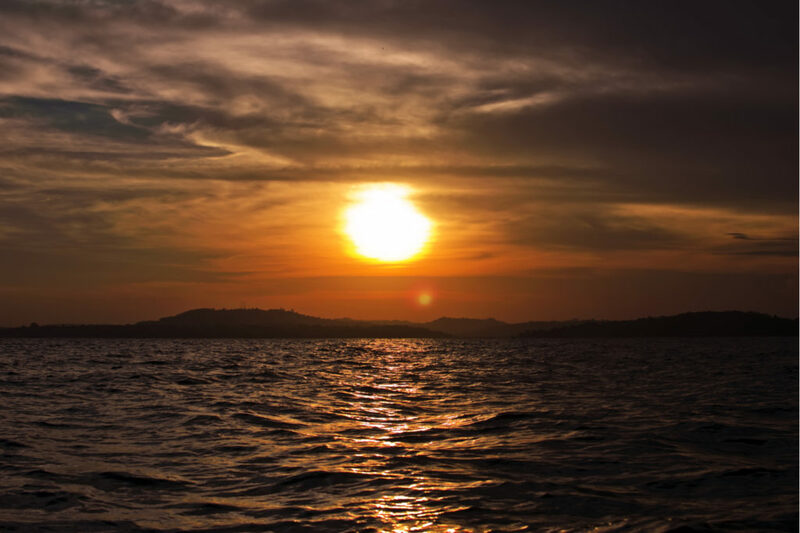 Lake Victoria ranks 9th globally based on volume with the lake having 659.8 cubic miles (2,750 cubic km) of water. The majority of water comes through rain runoff, however, there are a few rivers that flow into it with the Kagera River being the largest. The Uganda portion of the lake serves as a source of the Nile River, which is the only river departing out of Lake Victoria. Lake Victoria reaches a depth of 276 feet (84 m) averaging only 130 feet (40 m). The catchment area expands to 71,000 square miles (184,000 sq. km), with the shoreline stretching 4,438 miles (7,142 km) around the lake. Although, the largest portion of the lake is attributed to Tanzania at 49%. Uganda accounts for 45% of the lake and gets credit as a source of the Nile River. 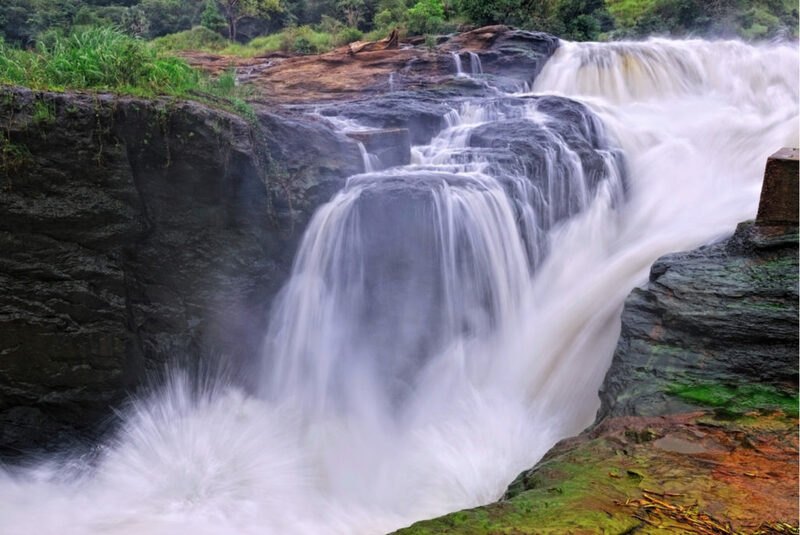 Murchison Falls has the distinction of being one of Uganda’s wonders, however as part of the Nile River, it can also be recognized part of the 7 Natural Wonders of Africa. 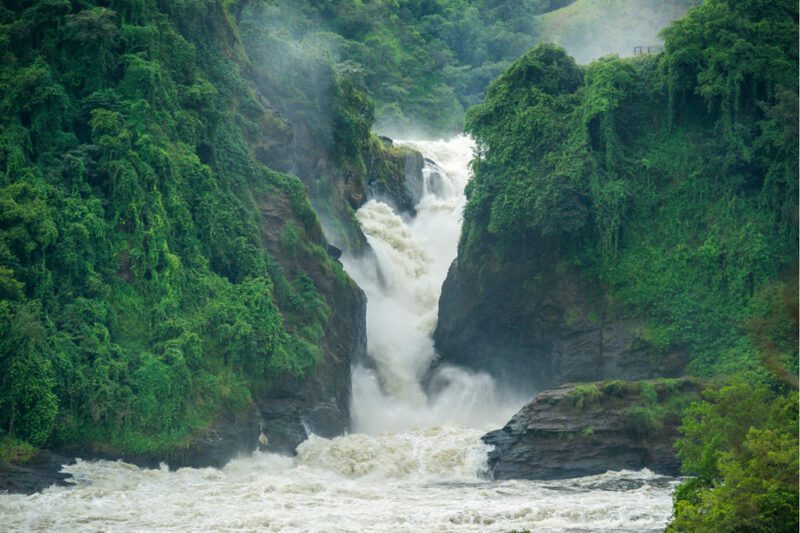 Murchison Falls, also called Kabalega Falls, is located on the White Nile River between Lake Kyoga and Lake Albert. Murchison Falls squeezes about 11,000 cubic feet per second (300 cu m/s) of water through a gap of the gorge measuring only 23 feet (7 m) wide. This creates an incredibly powerful flow of water falling over the 141 feet (43 m) drop as the river continues west. The falls serve as the inspiration for the surrounding Murchison Falls National Park. Visitors to this wonder attraction may also have an opportunity to see one of the 76 species of mammals calling the national park home. The park also houses Uganda’s largest collection of crocodiles. There are around 450 species of birds for bird watchers to experience.